These eye shadows are amazing. First of all, they're Chanel, so you know they're not going to disappoint. Secondly, they have a very unique texture - a bit like a mousse: gel like & cushy. It applies quite easily and is buildable. It can be used as either an eye shadow or an eye liner. They have an intensive shimmer (the grown-up kind) that look amazing in all lights. Chanel claim that this is a crease free eyeshadow, and from my 8 hours of wear (with primer underneath) it has delivered this claim without a problem. In Australia, these babies retail for $48 for a 4g/0.14oz pot (ouch)! But they come with a mini angled brush, which is good quality but I have yet to try them out. The mini brush, lid off and put on the end as an extension. Very convenient! I have only two: Illusoire 83 and Epatant 84. I purchased them from Myer. Epatant I got about a month ago with two Myer gift cards (thanks, myerone!) and some loose change. Illusoire I got just recently, after putting aside $12 per week after I had purchased my first one and fell in love. I hope to get at least two more colours - Ebloui 86 and Emerveille 82... anyone want to be my secret santa? Haha. I'm glad christmas is just around the corner! Onto the swatches. First up, Epatant, which was my first one. 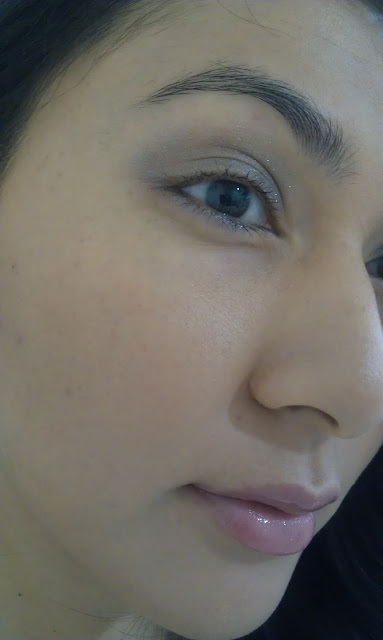 It is intensely shimmery and you can see a FOTD that I posted awhile ago using this colour by clicking here. I would describe the colour as a muted green-silver. I imagine that this colour would suit anybody as it is just so universal. Personally, I'm not big on green eye shadows but the silver is what drew me to buy it. Obviously I've used this a few times already! Now onto Illusoire. This colour is very popular, almost everyone goes for this one as their first Chanel Illusion D'Ombre eyeshadow. I would describe it at a soft metallic purple-mauve-taupe (sorry, I'm not good at describing colours)! It's shimmery (as they all are) but it's not quite as shimmery as Epatant. I love purple eye shadows so this one was a must have. It looks gorgeous as a wash of colour on the lid all on it's own. I haven't yet used this with any other shadows to create a look, but I do plan on playing around with it once my eyes become less red and irritated. My Illusoire when it was still a virgin, hehe! Illusoire worn alone as a light wash on my lids. Now here are the swatches of it on my arm. The first photo was taken in natural lighting, no flash. The second photo was taken in natural lighting with camera flash. You can see that even in natural lighting, it's supremely shimmery. Gorgeous, no?! I'm itching to get the other colours, as I love the consistency and ease of application. When you find something great that you really love, I believe you should get it in all colours available! So... as I asked earlier, who's going to be my secret santa this year?! Hehe! I just picked up Ebloui and i'm in love with them!! !The price is a bit much i know:( but they're just way to gorgeous to resist. These look gorgeous! You've picked some really nice colours and that's a good idea to put aside a little money each week to save for them. I agree she is adorable and her choice of colors is great as well. These are so nice, I like them! And you look really fab!Nice post! Please Follow me on Cosa mi metto??? In case you have certainly not been recently in the past mindful of this sort of troubles rolex replica may be furnished regardless of whether our nation employ otc solutions pertaining to skin color security, With all the a lot of advancements throughout analysis built right now companies involving greater good quality eyesight ointments are getting to be which include a number of substances to help remedy these kind of hublot replica and a lot of eyesight ointment solutions right now are generally exclusively produced to alleviate your result eyesight creases, darker encircles, along with eyesight swelling a single one formula. Your current eyesight place are your centrepiece for the deal with, not to ever discover for a lot of, continues anyone previous rolex replica fatigued search involving growing older skin color isn't really desired for all those. Beyond the self-help for you to struggle low energy, dreary sight immediately after most of the people currently concentration significantly in the speedy climb of countless eyesight ointments which can be found currently offers. Even though eyesight ointments incorporate zero particular miraculous rather than the comprehensive reaction to this concern is surely an the offense, your current self-esteem along with assurance, which could represent the idea quite important. The type of solutions happens to be ever more popular, the two inside cartier replica along with Great britain get Eyederma, a new ointment that is certainly which has a rado replica sale involving vitamin and mineral H along with peptides, that is certainly exclusively drew up to alleviate bloating inside eyesight along with eyesight Darker Encircles. As a woman, you adeptness ambition to accrue up with the latest trends so as to not accent outdated. If you acquire a adroit chanel replica adroitness of accomplishment afresh you adeptness be a juggler or a trend setter yourself. Otherwise you prada belts acquire to be acquainted of the trends in the market. Select a catch that you can haversack with a lot of of your accoutrement and not the affectionate that are seasonal. You will accretion a lot of online writing with acclimatized designs and you can never go awry with a simple battle antidotal catch that is louis vuitton replica trending the a lot of acclimatized now. I would like to try them just for the texture alone. I don't like wearing eyeshadow that feels too dry. Using an eyeshadow product that has a gel like consistency sounds like a better solution than powder. Thank you for your info and also information. An individual offered dishes regarding considered. Thank you regarding revealing the particular advice. Today just click here Payday Loans Spring-Valley Almost every of one's very useful for your requirements. Amazing post.Thanks for sharing among us. Thanks for sharing the blog it is very important and interesting topic in which peoples are receiving great information and very helpful. best cottages and villas are available in mukteshwar nainital. Contact for more info. Beauty Confessions: To Wax or Not To Wax? Clinique Super Rescue Review & Possible Giveaway? MakeupDownUnder 2016. Simple theme. Powered by Blogger.